We've seen him as hosting reality shows on television. 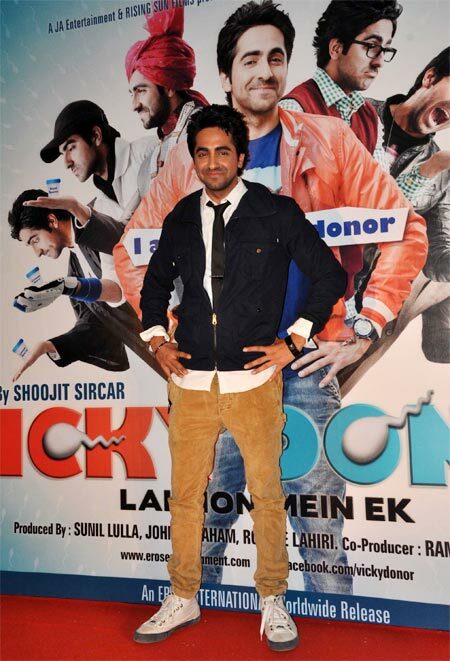 Now, you will see this veejay-turned-actor Ayushman Khurana making his debut in this week's release Vicky Donor. Directed by Shoojit Sircar, the film is produced by John Abraham. The actor will be seen playing a sperm donor in the film. Ayushman spoke to Sonil Dedhia about his big screen debut, his journey from television to films and much more. As a VJ, you have done a lot of interviews with celebrities. How does it feel to be on the other side? I think it is very awkward. I feel really uncomfortable (Smiles). I am trying to get used to this. I think it is easy to ask questions and difficult to answer. Was being an actor always on the cards? Of course, I always wanted to be an actor. Since childhood I have been active in theatre, music, and other co-curricular activities. I was the co-curricular caption of my school, St John's High School, in Chandigarh. Even in college I was very active in theatre and I formed two theatre groups, Aghaaz and Manchtantra. I went on to do courses in journalism, radio and theatre simultaneously. In the meanwhile, Roadies happened to me when I was in college. Generally, reality contestants want to shift base to Mumbai and try their luck in television. I didn't do that because I wasn't prepared for it. I went back and completed my education and after a while came back to become a VJ. You were born and brought up in Chandigarh. Was your family okay with your choice of showbiz? Mumbai is a cosmopolitan city where people accept the fact that one wants to become an artist, an actor, or a singer, but in Chandigarh, you can't really be honest and say that I want to become an actor. I never said that. Though I always wanted to become an actor, I just didn't have the courage to speak my mind. Though Chandigarh is a city, people are very conservative and conventional there. So when I was doing theatre, I guess everybody got the hint that I was interested in the performing arts. Was it difficult to convince your parents to let you move to Mumbai? Not at all. My parents are very progressive. When I was doing theatre they were okay with it. From your first small screen appearance in 2004, you actually did take a long while to make it into films. Did you get offers prior to this film too? I got some offers which were second leads, which I wasn't interested in doing and sometimes directors didn't like me. Either way, I was waiting for the right opportunity. I was waiting for a director like Shoojit Sircar. You can do anything on TV, you can fool around, you can mimic people, you can make fun of people, but when it comes to films, you have to be really choosy. Did you have any apprehensions doing the role of a sperm donor? In 2004, I did donate sperms for a task in Roadies. It was a part of my research. But apart from that, Shoojit Sircar did a lot of homework, met a lot of pathologists, visited IVF (In Vitro Fertilisation) clinics and sperm banks so I think it's very credible. Apart from that, I think it comes very naturally to every male so I didn't really have to get into the skin of the character. I play a Punjabi guy and that came very naturally to me. But Vicky is a slightly loud character as against Ayushman. I am slightly subtle in real life. IVF clinics were irked that the term 'designer baby' was used when promoting the film. The thing is 'designer' is not medical jargon. I said it in the context of designer sperm donors because childless couples look for certain traits in their kids. They have the right to choose the donor. I realised later that 'designer baby' is a term which is used in the medical arena for genetic engineering. They use it to change the eye colour or the height or make a perfect human being, which is unethical. Having now moved to films, do you feel that anything that you say on camera can have negative repercussions? I am not a star. I am just a newcomer and I can be politically incorrect. I am just being myself. Did you audition for the film? No. Director Shoojit Sircar was looking for a typical North Indian guy who was young and chirpy and could connect with the youth. I guess I fulfilled all his requirements. The film deals with a sensitive subject that is presented in a comical way. This might not go down well with audiences. There is a thin line between being funny and being a caricature. This film is beyond comedy. We are dealing with the subject in a very mature way and when the audience watches the film they will surely be surprised. You have composed and sung a song (Paani Da Rang) for the film. Do you have an inclination for music? I write poems in Hindi. I wrote the song back in 2003 along with my friend Rochak Kohli. He is now heading a radio station. We were looking for a perfect launch pad and I got the opportunity with Vicky Donor. I don't think I could have got a better stage to showcase my talent. After the good response to the song, will you compose more songs for your films? If I get more films, I will compose songs and sing for myself. You spent considerable time doing television, and you must have received many offers to star in television soaps. Did you hold back your acting side for movies? May be you are right. I think on television you get overexposed very quickly and the shelf life is pretty short. I think being a VJ I was quite secure in that space. Somebody like Nikhil Chinappa has been there for the last 15 years. So, relatively, I think we have a better and longer shelf life. You don't have any industry contacts. Do you think star kids are much more privileged in getting better projects than an outsider such as you? If I were a star kid, I'd have made my debut four years ago. But I think that's the fun part of it. I don't have a godfather in the industry. I have made my own niche and I am pretty proud of it. I think star kids deserve to get opportunities -- their fathers or mothers have worked really hard and acting is in their blood. I think a lot of star kids are doing well. I like Ranbir Kapoor. I think he is brilliant. He wants to be a director and revive the RK banner, which is commendable. Even Arjun Kapoor is looking very good in Ishaqzaade. They deserve to be there but it is slightly difficult for outsiders. It doesn't matter, it happens everywhere. Even in business, the tycoons have their heirs joining them. Will you continue doing television? I think there is a nice symbiotic relation between television and films. I am open to quality work be it in films or television. As of now, my agenda is films. I will probably look for a bigger role in a reality show as an anchor and be a little selective. I will take one thing at a time. I have a two-film deal with Shoojit Sircar so I am doing his next film Humara Bajaj. It's the story of a small-town, struggling actor called Sanjay Bajaj who aspires to become an actor and ends up becoming a superstar, but there are certain challenges that he faces. We start shooting for the film in December. PIX: What are Bollywood stars selling this summer?